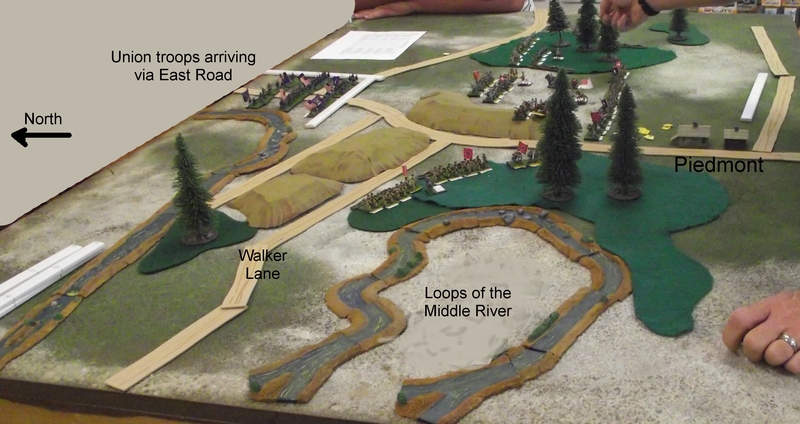 The local HMGS-South group played a game based on the first battle of Kernstown, March 23, 1862. Johnny Reb III rules were used. 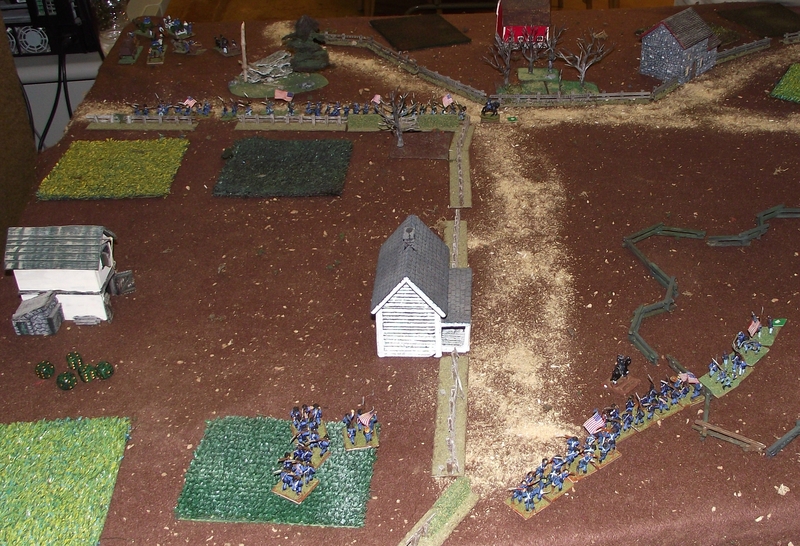 The outnumbered Confederates took the bulk of the casualties, but achieved a strategic win by delaying the Union troops. 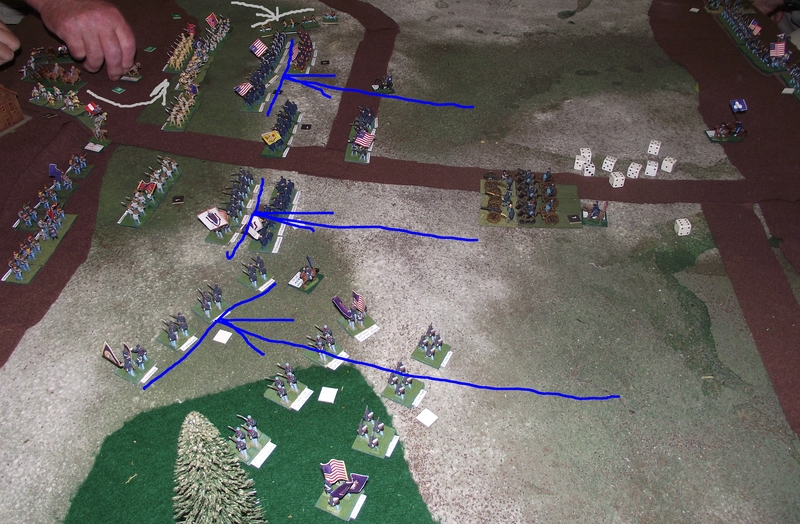 The initial cavalry clash. 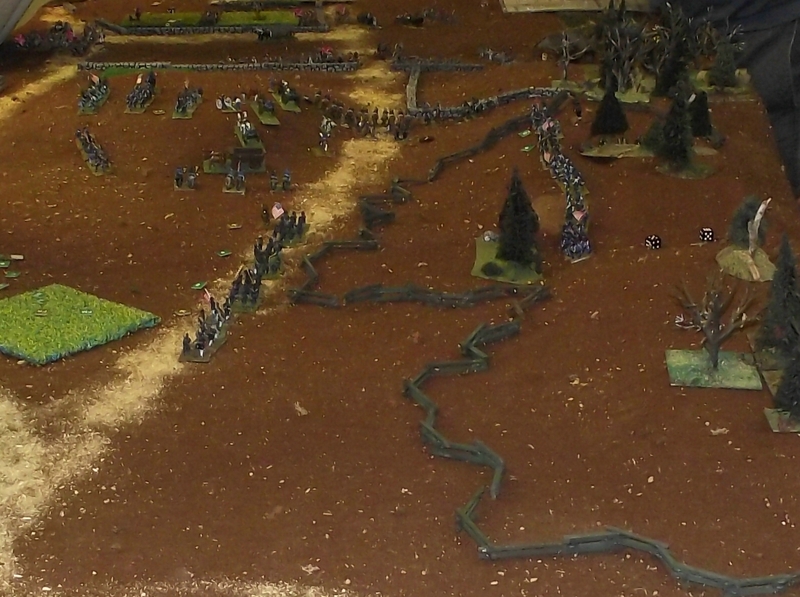 The Union troops have made a charge straight down the road to forestall the Confederate advance. 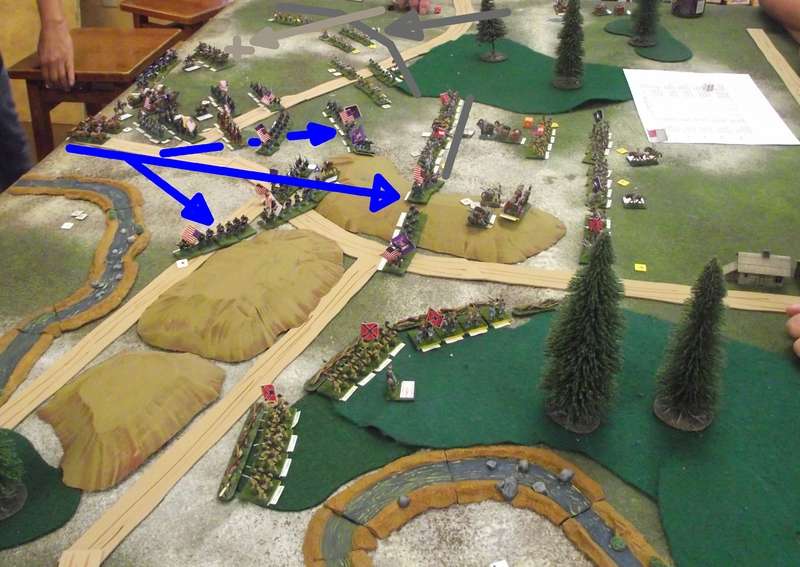 Union infantry arrive via several roads. The main road is crowded with Union reinforcements. 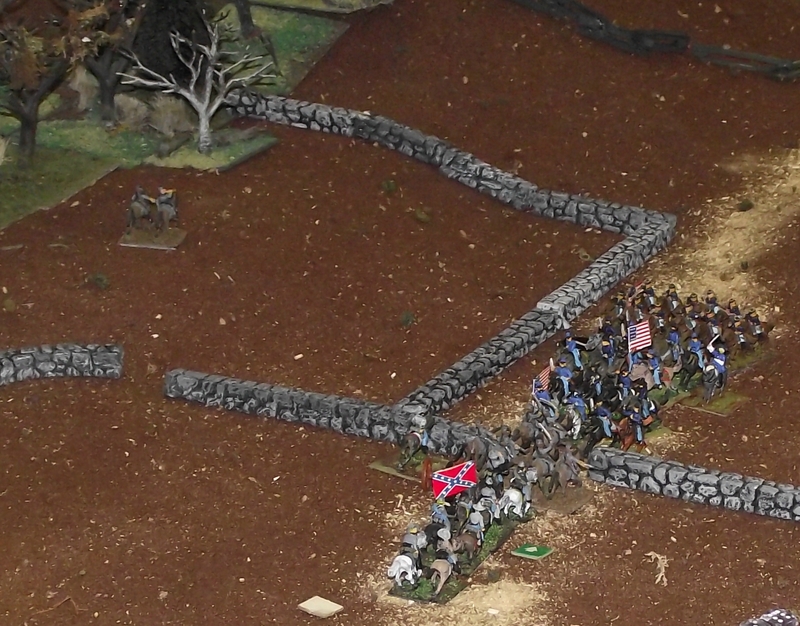 Confederate guns and infantry rush to occupy the stone walls. 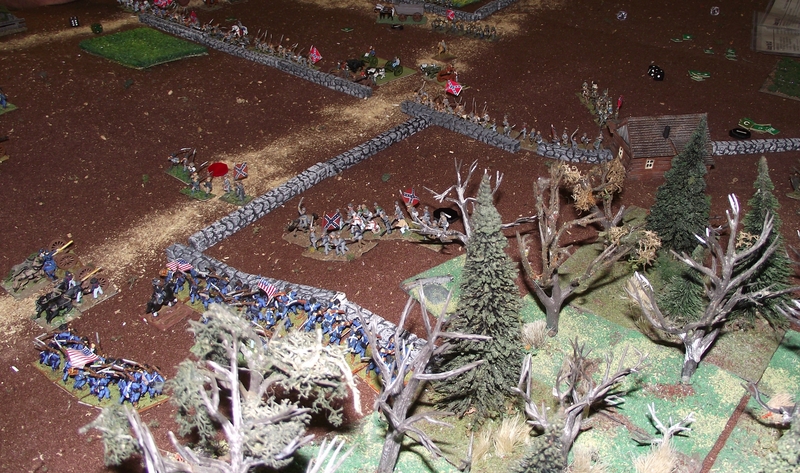 The cavalry on both sides have fallen back after the initial clash. 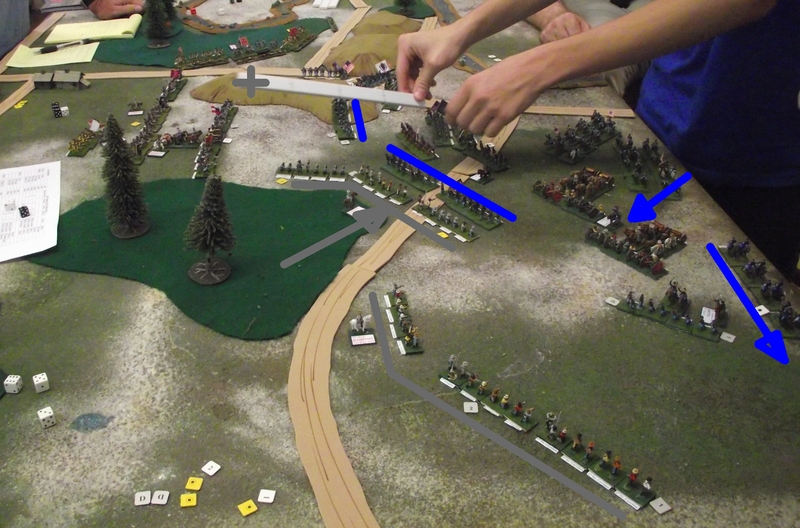 Union infantry moving off the road to make way for the guns. 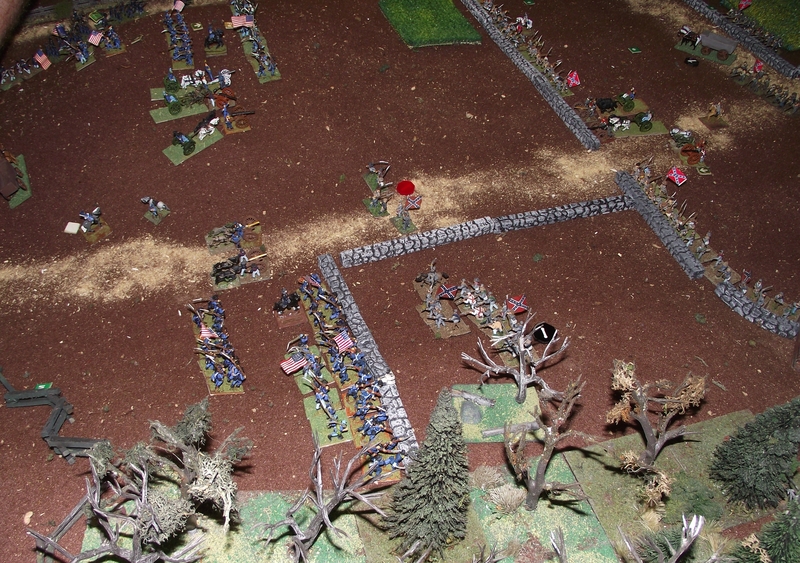 Union troops occupy the hill. The battle lines form up. 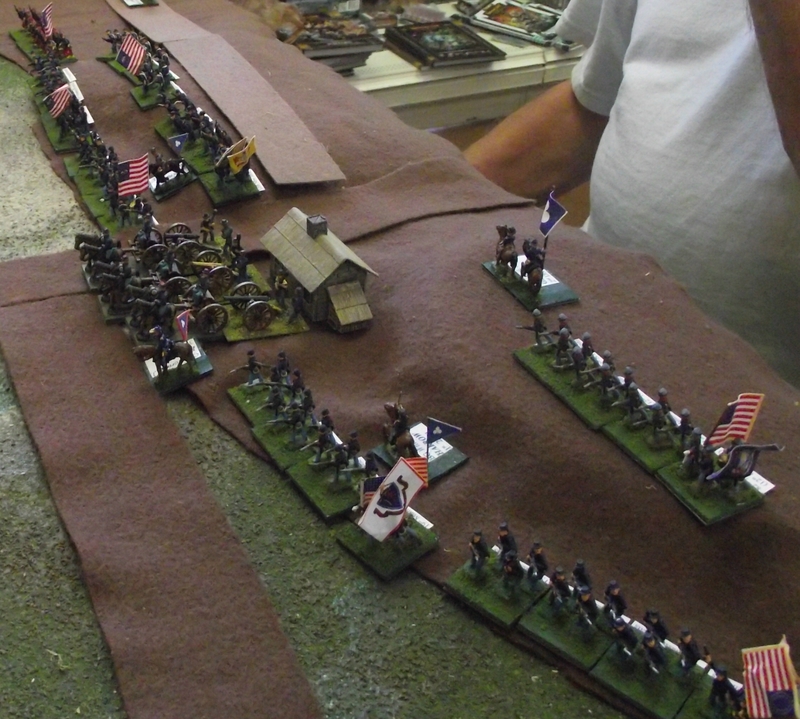 Union infantry and cavalry try to skirt around the left flank. 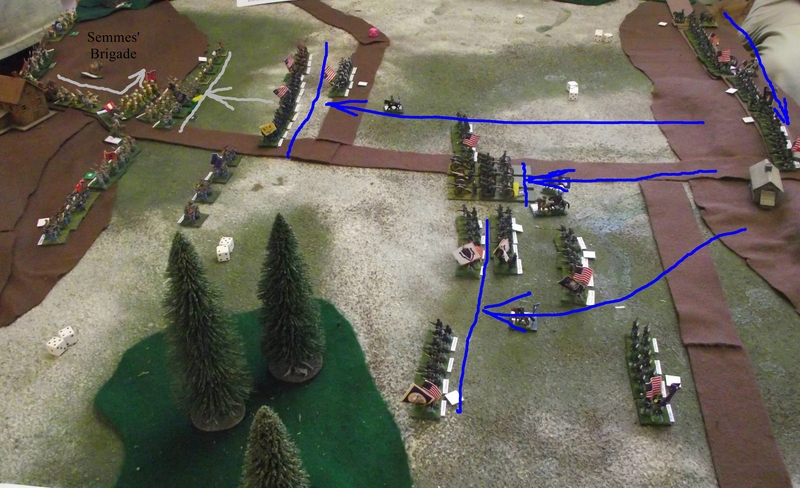 Confederate reinforcements have arrived via a road close to the lines and formed up on the right. 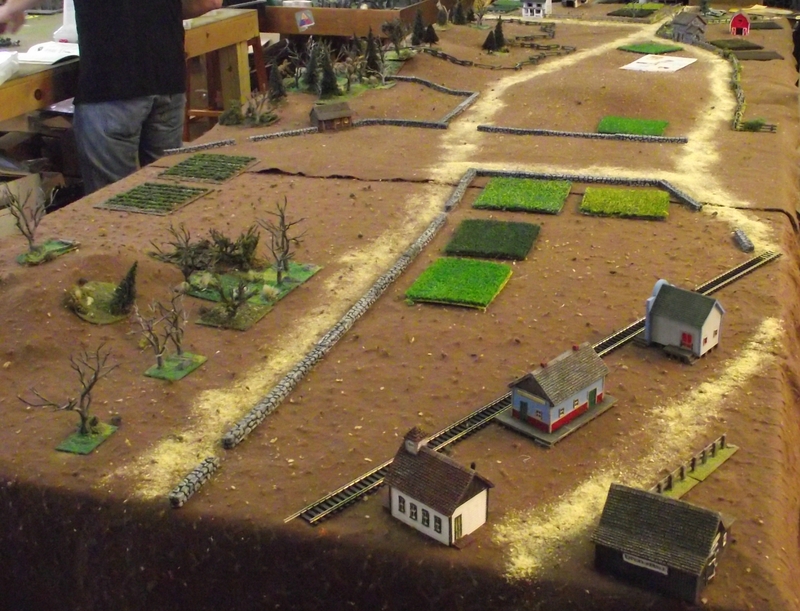 Another attempt to reuse old game pieces: TFP (Total Fighting Power) Games counters for American Civil War (the original game was called ‘Iron and Fire‘) used with Black Powder rules by Warlord Games. 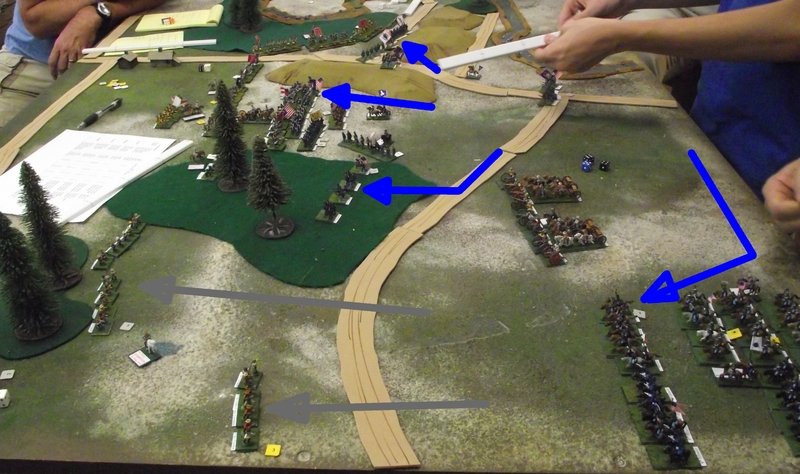 The TFP brigade organizations (3 infantry regiments and an artillery battery, 4 infantry regiments or 3 cavalry regiments) with some Union artillery attached at division level work well with BP. 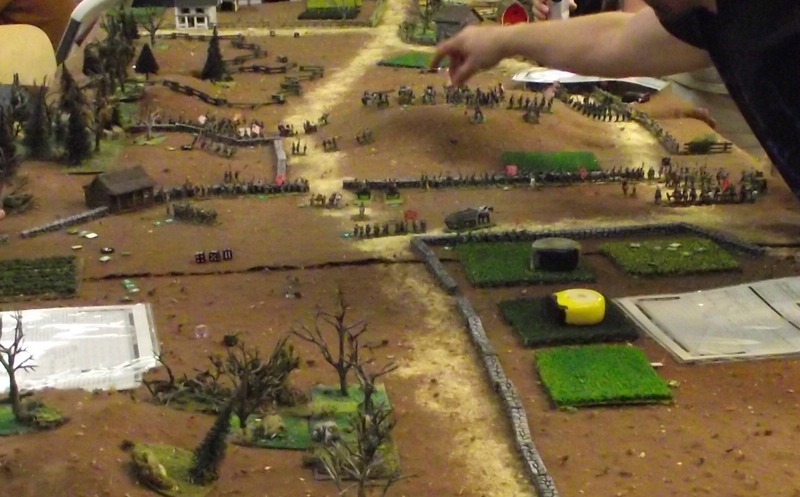 The Union attempt to ‘get there firstest with the mostest‘ failed due to bad command rolls.